The Great World Holiday Season is approaching, Angkor Kids Center is ready to celebrate with you with the following updates and stories from our school. Firstly, we would like to proceed our appreciation and gratefulness to your support and contribution in kinds and cash to help our school running upto now and ongoing. Secondly, please let us bring you with a few updates from our school. Thank you Chhay for doing the great job over the time, even some tough challenges have happened. There are 8 English classes + 2 computer classes now in total. From 5 – 6 PM, there are 3 classes with 25 to 35 students per class, taught by Mr. Kroem KRUOCH, Ms. Pich HIEN, and one class co-taught by two new teachers, Ms Soeb LEAK and Ms Chandeng HUY where were our AKC former students. From 6 – 7 PM, there are 3 classes with 25 to 35 students per class, taught by Chhay, our staff and the other two classes taught by all new teachers and our former students, Mr. Pros BOT and Mr. Chert Khorn in one class and one class co-taught by two teachers, Ms. Saran NGEK and Ms Kha LIEM in one class. From 7-8 PM, there is only one class taught by our paid staff Chhay again. During the weekend, Saturday and Sunday, our former teacher, and founding member of All For Kids Organization, Mr. Meam BY is teaching the teachers and adults with the most advanced level. He is teaching from 7 – 8 PM on Saturday and Sunday. Mr. Chhay LEAB, the only paid staff at AKC is teaching two English classes as above mentioned and he also teaching two computer classes (basic lesson / typing and office). His computer class on 10 – 11 AM and another one 8-9 PM with 8 students in each class and this the maximum numbers that we could accommodate. Beyond teaching, Chhay is taking care all the school management, students and teachers attendant sheet, library controlling, school maintenance, and make the report to the Project Director, Samnang Chhon. 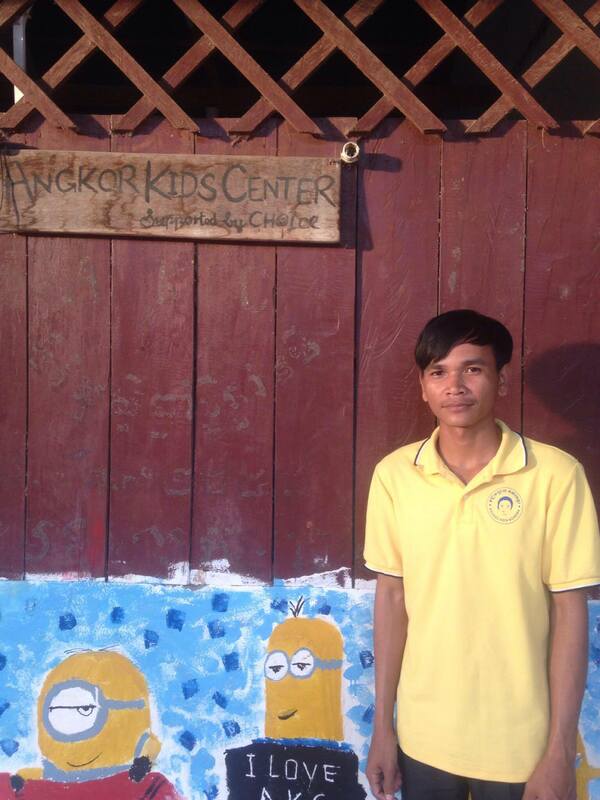 Moreover, Chhay also looking after the Chicken farm as well. With recent project idea and approved by Helpucation e.V., we now have internet WIFI for some basic internet access. 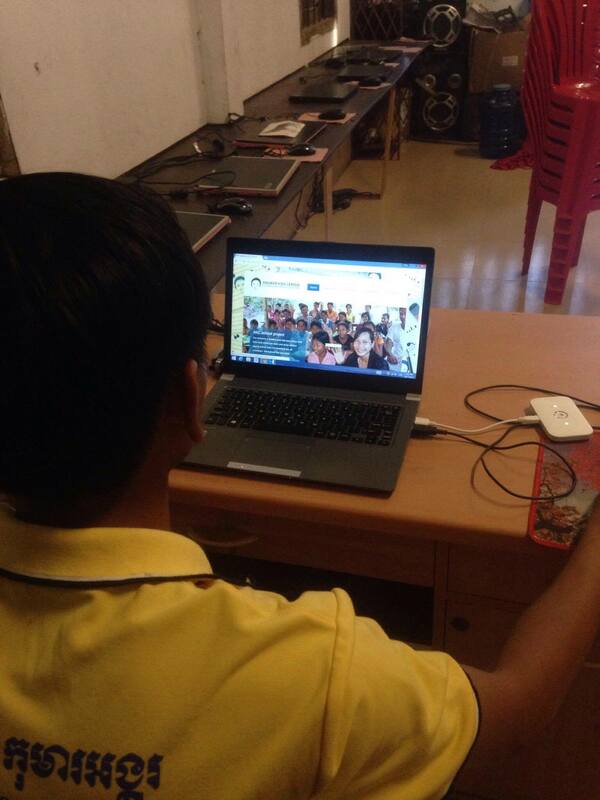 Chhay could now show his students how to use some social network channel, and he can also connect to the team on Internet. With the proper solar system installed for our school, there are really a few thing happening such as we can have the computer class, no class disturbance with electricity running out, and now with also a donation from our nice friend Mr. Soeun, we have an LCD projector that could be used for many things especially the Kids English Movies night. Special Thanks to Helpucation e.V., your presence has become our safe, sustainable foundation on both and advice and financial support. “ With Helpucation e.V. I could have a big break, go back to my school, spend time with family and paying the great attention to Asia Natural Tour which is my pot of rice, Thank you Helpucation team”, Said Samnang Chhon, the AKC Director. We are looking forward to the fruitful work in 2018. Born just inside the Angkor Archaeological site, I earned my career lives by switching from a countryside boy to one of the top level jobs in tourism career and today I am the Co-found of Asia Natural Tour. To the extend that I get education and today better life is because of the Charitable people I met and meet, I am passionate about doing social work to give back, and share the stories of Cambodia. Copyright © 2019 ANGKOR KIDS CENTER.